Dirty Whisky can be wonderful if you enjoy that thing, dirty sherry especially, and whenever I come across such a cask, which displays enough dirtiness, without being way “off”, it is a time to be merry. 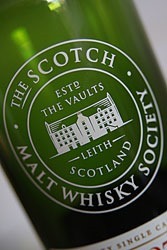 This 16 year old Springer from the SMWS is such a dram. Distilled in 1992, comes from a big badass Gorda cask containing some 600 liters at a nice 58.3% abv. A true springbank, and a lovely dram. Nose :that’s a very meaty springer. Starts off with oxtail soup sort of nose. Meat consume,Gunpowder galore. Lots of dirty sherry influence. Rubbery and earthy. A hint of dried fruit and a wine-y edge too. absolutely cracking. Mouth: Oh this is good. This is a brilliant palate. Starts off dirty and smoky with guns just fired, nearby (guns, not a gun!) Some seaweed and old leather sofas with red berries in smoke. Sherry and more rubber. Great balance and complexity. I do love this. Finish : Smoke, leftovers of meat broth, caramel and spent matches. Nuts. Dirty. Yet brilliant. In a few words : Sitting on an old leather sofa after hunting in a field.